The Irish Sailing Awards saw Bray Sailing Club win two categories at the annual ceremony held in the RDS on February 8. Jack Hannon picked up the inaugural Volvo Irish Sailing Inclusion Award for his work building a relationship between the sailing club and local special needs sports club Bray Lakers. Hannon developed a new programme to allow people of all abilities to enjoy sailing. “Jack has been pivotal in building the relationship between Bray Lakers and Bray Sailing Club and developing the new programme ensuring people of all abilities get to enjoy sailing,” read the award. 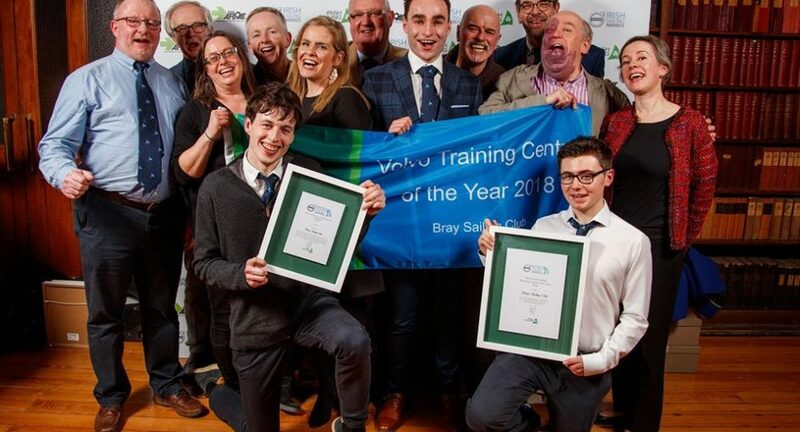 Bray Sailing Club itself was named Volvo Irish Sailing Training Centre of the Year following its second nomination in the category. The club embarked seven years ago with a plan to expand the sport to all social classes, ages and abilities. Membership has since soared to over 300, with members as young as 8 and as old as 80. “This season, numbers on the water have increased again. Everyone from the youngest member to the oldest has been getting involved and getting wet, and their fleet has grown and adapted to cater for all levels and all abilities”. “It is without doubt the product of many years hard work and commitment by our Training Centre Committee and Volunteers especially the outstanding efforts of our Instructors, led by Senior Instructor Jack Hannon, supported by the club membership”.